Arrived to park in the centre of Reeth, consuming Ron's delicious Bacon Butties (except Colin). Walked several hundred yards before having to consult the map and then finding the route to follow the river beneath Fremington Edge all the way to Arkle Town. After crossing the river we headed up and over Reeth Low Moor dropping down to the road where we stopped to consume Neil's Pork Pie and some of our sandwiches. We then followed the road to the start of track up to the disused Old Gang Lead Mine workings. After crossing the river at the top of the Gill, we again headed up crossing Bownsey Moor before dropping down steeply into Swaledale to stop at the recently refurbished Punch Bowl Inn at Low Row. Four pints of Black Sheep were consumed (except Alan & Ron), before we headed off down the road, stopping almost immediately to consume the remainder of our sandwiches leaning against a wall. Continued along Swaledale about 4 miles back to the cars at Reeth. Weather: A dry and pleasant walking day!!!! Weather: A dry all day, turning into a fine afternoon, albeit a little windy. Arrived at the Low Mill car park just after 9am, where Ron was already waiting. 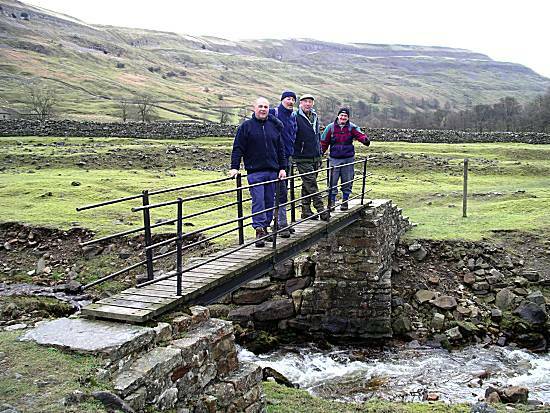 After devouring his excellent bacon butties (including Colin), the group set off through the village and climbed up to follow the long track along Rudland Rigg towards the Dale Head. 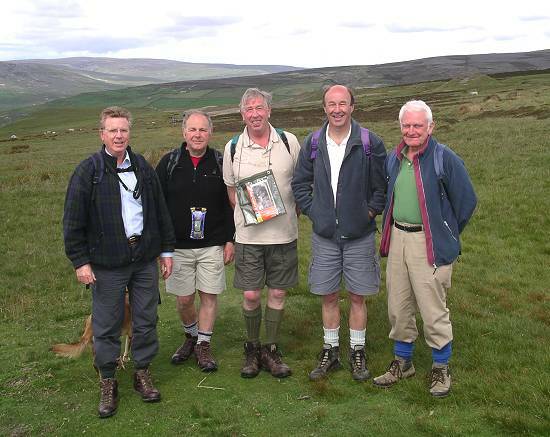 Some dispute was heard when Colin suggested that the group follow a route across the heather that obviously had not been walked for a considerable period. 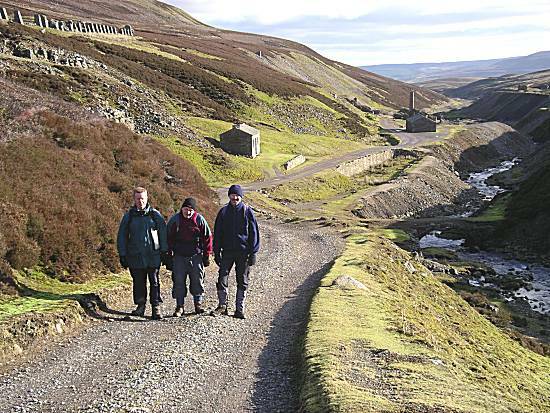 After overriding Colin's better judgement, the walkers continued to Bloworth Crossing to take the route of the old railway line around the Dale Head, stopping briefly for sandwiches and Sean's excellent Pork Pie. 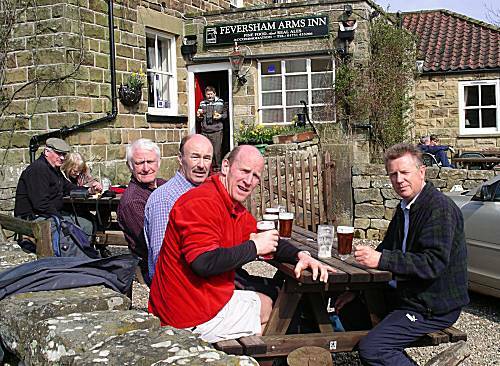 Later dropping steeply down to join the road, which eventually led us directly to the Feversham Arms in Church Houses, where 5 pints of Black Sheep (except Sean) were enjoyed and later shared a bowl or two of chips. 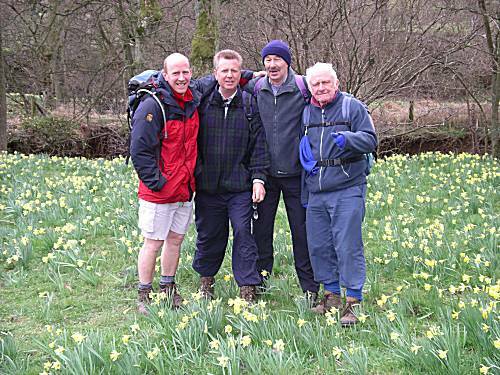 After lunch they followed the short route through the daffodils fields back to the cars at Low Mill. Parked opposite the Red Lion in the centre of Burnsall and after consuming Ron's Bacon Butties (except Colin), we set off, crossing the river and heading up the bank to follow the roadway into Hebden. Afterwards we joined a track heading up Hebden Beck, past Hole Bottom towards the disused Grassington Mine workings, where the many information boards provided much interesting information about life in the Lead Mining days of Yorkshire. Continued onwards through Yarnbury, stopping to share a large "Elite Meats" Pork Pie, before intersecting the Dales Way, which took us back and into Grassington, which already busy with many tourists. Stopped at the "Foresters Arms" where we sat outside to enjoy a number of pints of Black Sheep and Timothy Taylors, together with one bowl of expensive chips. 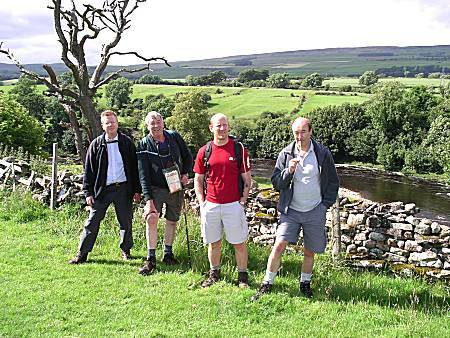 We left Grassington continuing on the Dales Way, which followed the River Wharf some 3½ miles back to Burnsall. Started from a roadside position about 1½ miles west of Marske, when everybody arrived together around 8-20am. Cliff provided excellent Bacon & Sausage Butties and afterwards we headed off across a fields, where Ella spent much of her time chasing rabbits. Followed the path through many old lead mine workings, past the village of Washfold and on upward across Marrick Moor to eventually drop steeply into Arkengarthdale just below Arkle Town. 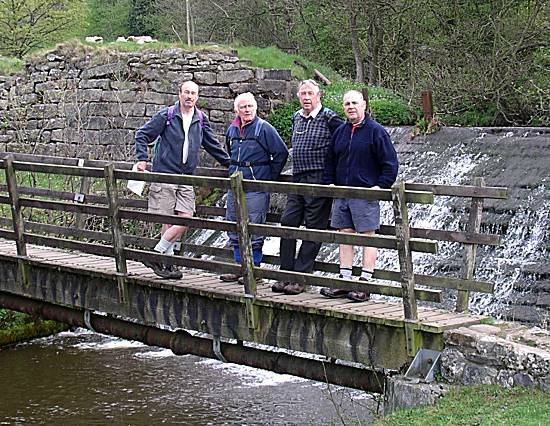 We crossed the Arkle Beck on the footbridge to stop briefly for a photo opportunity. Later after a short Pork Pie stop, we continued along the dale, through Reeth which was busy with tourists, and then to cross the River Swale on the suspension footbridge (re-built in 2002). Followed the river along to stop for a lunchtime break at the Bridge Inn at Grinton, where 5 pints (except Ron) of Jennings Cumberland Ale were enjoyed, along with 2 bowls of chips. After lunch at Grinton the route following the river to Marrick Priory and then up the steep Monk's Steps, where a stop was made at the top to buy Ice Creams from a pleasant lady living in a converted church. The last short stage crossing fields and past more derelict mine buildings back to the cars. 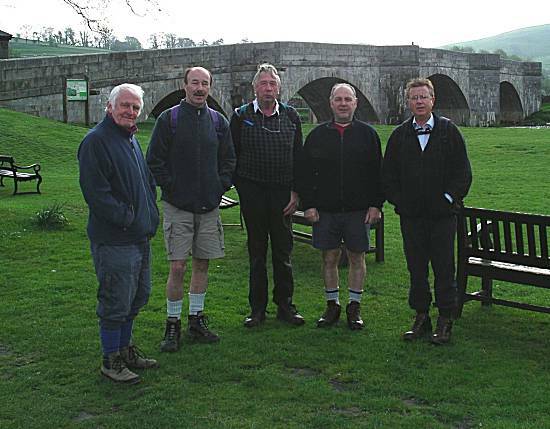 It was agreed to repeat the walk originally undertaken on the 18th November 2006, but spoilt by heavy rain all day. Despite an earlier good weather forecast, the day started with drizzle which lasted all morning. Left from the layby close to West Witton and after enjoying Cliff's Bacon and Sausage Butties, walking through the village and heading up past the caravan site and cross country to drop down to the picturesque waterfall at West Burton, where a short break for a photo opportunity was taken. Left through the village of West Burton towards Thoralby to cross the river, stopping to have sandwiches and some of Neil's pork pie in the rear garden of Cliff's house. Headed up the steep bank from Thoralby and onwards in the rain towards our lunchtime stop at the George & Dragon in Aysgarth, where 5 pints (except Ron) of a very pleasant Black Sheep and John Smiths ale were enjoyed. Cliff order portions of chips which greatly appreciated. 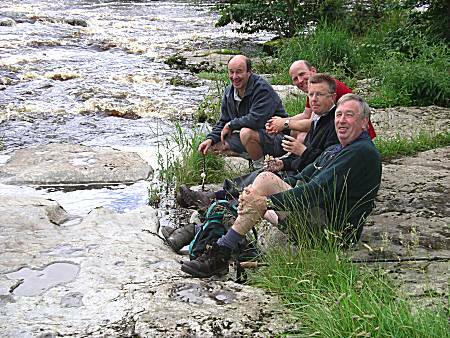 Whilst we enjoyed our ale the weather improved and we left in the sunshine to enjoy the remainder of the walk. Walked past the Aysgarth falls, stopping for the remainder of our sandwiches by the fast running river, below the falls. Made our way back to West Witton through Wanlass Park. 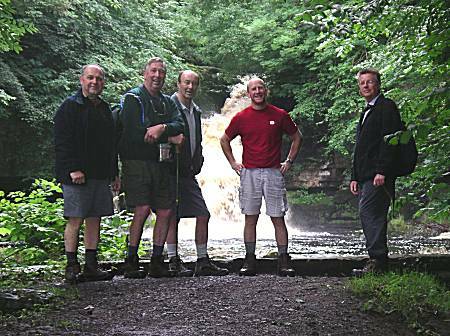 Walkers: Cliff (Leader), Ron, Neil, Sean and Alan. Enjoyed Ron's Bacon Butties at his house before travelling to the Richmond car park which had reduced its charges to £3-00 per day. After climbing up the steep pathway, stopped briefly to watch the Policeman catching numerous motorists with his speedgun. Travelled a little too far round the old racecourse before heading across a golf course, past Aske Hall before for the Pork Pie stop. Followed the correct route along the track to Ravensworth, which although was indistinct in places, no error were made, unlike previously. Arrived at "The Bay Horse" in Ravensworth where 4 pints of Marstons Pedigree Ale were enjoyed. Afterwards headed back, passing Kirby Hill, before taking a little while to select the correct track towards Richmond. Ron & Alan viewed "The Jockey Cap" on route to "Whitcliffe Scar", although Neil was unaware of this phenomenon. Followed the path and roadway down into Richmond and back to the cars. Weather: Warm, but the promised sun only appeared briefly. 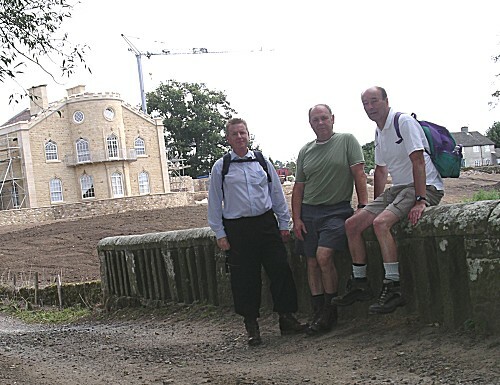 Walkers: Neil (Leader), Ron, and Alan. As we were unable to park in the usual station car park, we parked by the castle and walked to meet Cliff who had parked in the nearby fishery to enjoy his excellent Bacon and Sausage butties. Colin, who was not looking forward to the second climb after Newtondale Halt and the trudge across the moor, took the train to Goathland and therefore was waiting for us at the pub in Beck Hole. 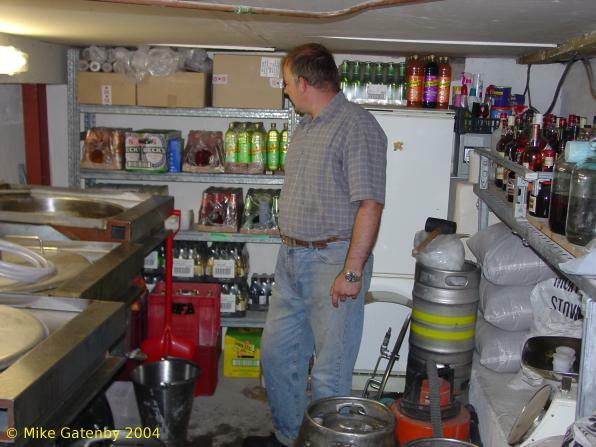 Most of us enjoyed 5 pints of Black Sheep ale in the Birch Hall Inn with good banter. Left in time to complete the walk to Grosmont in time to catch a busy train that departed around 16:45. 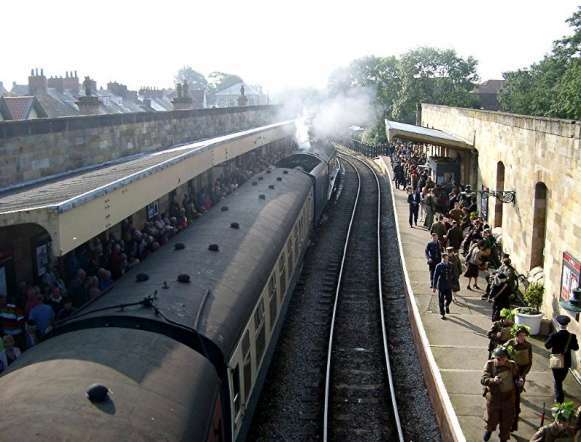 Arrived back in Pickering around 18-00. Weather: Damp and humid all day and wet underfoot. 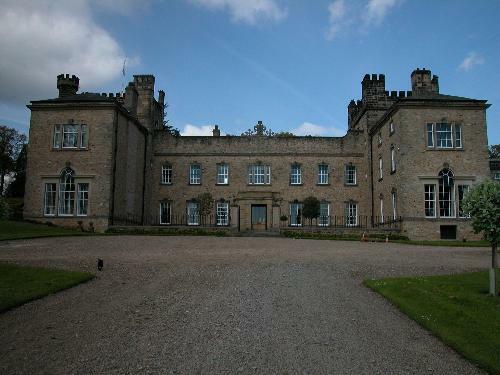 NORTH OF RICHMOND WALK - Saturday 17th November. Met at at the edge of East Layton village to enjoy Ron's excellent Bacon and Sausage butties. Headed off passing through Caldwell towards Eppleby, but finding the footpath across a newly seeded field completely ploughed up, took a long detour around the field. Passed many well kept farms, all having a "horsy" theme. Stopped to consume Alan's well filled pork pie just before reaching the Four Alls Hotel in Ovington, where we were joined by Tom on his bicycle for a number of well deserved pints of ale. Discussed the merits of the local ales produced in the Micro Brewery based at the hotel. Weather: Pleasant and dry all day, but quite cold. 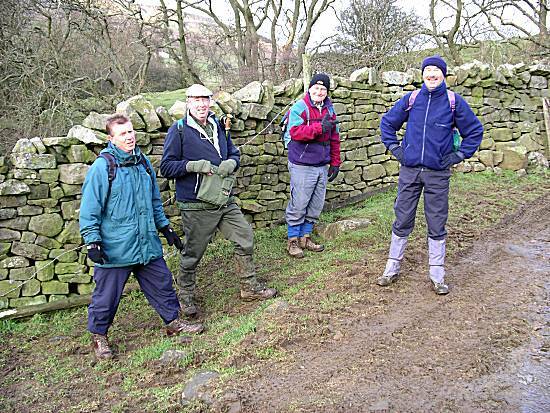 The walkers travelling through horrendous weather on the way to the familiar small grass verge just south of Leyburn, where Bacon and Sausage Butties, courtesy of Ron were enjoyed. Due to flooding of the fields and high winds they departed just before 9am taking the road to Wensley, where Cliff spent some time trying to return a small dog to its owners, as he seemed determined to join us for the whole walk. Followed the private road to pass the front of Bolton Hall having chatted briefly to the owner who was walking his dogs in the grounds. Re-joined the original route having missed out the "Leyburn Shawl" section of the walk which would have been extremely windy in its exposed location. Crossed the very flooded and fast running River Ure, stopping to shelter for a while behind a wall from the wind and rain. Eventually continued upward towards the Middleham Gallops where only a few horses were seen being exercised, before dropping down to pass the castle and then across to meet the River Cover by the stepping stones which were totally submerged beneath the fast running river. Stopped shortly afterwards to share Cliff's superb home made pork pie, greatly appreciated by all the walkers, including Moss the dog. Followed the river the last half mile to arrive at the welcoming, but crowded Coverbridge Inn just after Midday. The walkers soon positioned themselves close to the roaring fire and after several pints of Black Sheep ale, were able to slowly clear the pub, with their singing, lead by Tom. Looking at the worsening weather outside and considering the excellent ale and hospitality provided by Nick the landlord, the walkers soon abandoned all thoughts of completing the final stage of the walk. With the help of Roger, who had made a guest appearance, lifts were given back to the cars which were re-positioned within staggering distance from the pub. The walkers finally left around 4pm to be chauffeured home by the non-drinkers. The walkers all agreed that it had been fine and memorable Christmas Walk. 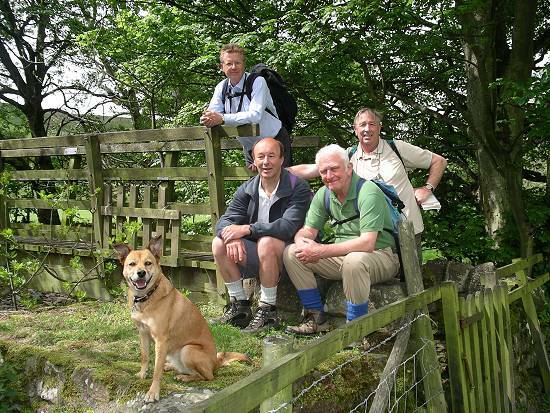 Weather: Rain and Gales, with snow on the tops of the hills..
Walkers: Ron, Neil, Alan, Sean, Colin, Cliff (Leader), Paul, Andy and Tom (with Moss the dog). Guest appearance of Roger Percy at the Coverbridge Inn.